Our identity unifies our organization with a single, strong brand that is distinct and easily identifiable. The appearance of our logo draws on our heritage and the principles in which we serve and function. The official graphic signature of UTM consists of two elements: the logo and the Universiti Teknologi Malaysia typeface shown above. The position of the open book placed on top of the circle encapsulates the idea of a universe governed by divine laws as decreed in the Qur’an. The crescent encircling the flask shows that all pursuits of Science and Technology are done in accordance with Islam. The position of the flask directly below the golden book shows that all advancements in Technology emanate from the Holy Qur’an, the ultimate source of knowledge. Thus, the values and principles which we ascribe to revolve around the core tenets of Islam, with its philosophy based on the premise that the divine law of Allah is the foundation for Science and Technology. The colours that we choose for the corporate image of UTM signify certain elements which reflect our identity and value. Please try to avoid any colour combinations. 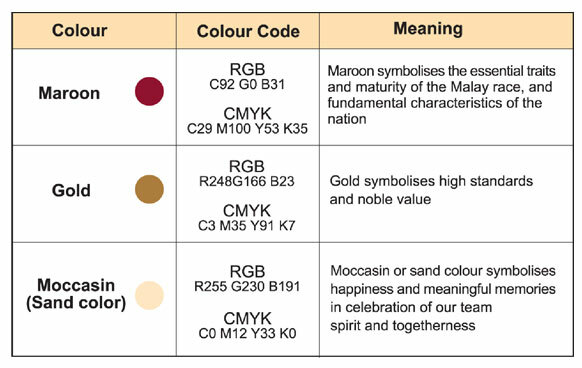 The use of these colours will be consistent in all forms of printed materials and other media. Other colours used in combination with the corporate colours should be in harmony and not in contrast with the corporate colours. The logo and the Universiti Teknologi Malaysia typeface should not be used independently. They should always be used together to form the complete signature, which reflects the UTM brand identity as a steadfast, strong and scholarly institution. The Universiti Teknologi Malaysia logotype is set in 12 point on Inai Mathi Bold (condensed 80%) typeface and the UTM abbreviation is set in 84 point on Baskerville Bold typeface. Divisional offices alongside the signature is set in 12 point on Garamond Bold (condensed 80%) typeface. When choosing a colour, it is important to consider the best opinion to project the information clearly, effectively and complementing any chosen images. There must always be good contrast between the text and the background colour. Dark colours on a white or very pale background are the most legible. White type should only be used on a very dark background. (iii) A single-colour signature can also appear on a sufficiently contrasting colour or photo graphic background.